Shakti is the divine power that underlies creation and manifestation. Shakti is the concept or personification of divine feminine creative power, sometimes referred to as “The Great Divine Mother.” On the earthly plane, Shakti most actively manifests through female embodiment and creativity/fertility. Shakti energy is both responsible for creation and the agent of all change. Shakti is cosmic existence as well as liberation. Each morning I enjoy a stroll around the historic Hot Springs area of Truth or Consequences. As I set out, I look forward to delightful surprises - a mullein plant next to the sidewalk, cactus blooms, the sunrise reflecting on the Rio Grande, a conversation with a spa visitor, or greeting a neighbor. Today was no exception. Though I've passed the intersection of Austin and Mims many times, today I looked up and noticed something I had not seen previously - this patio cover of latillas with the ends carved and painted to resemble sharpened colored pencils. What a delight - something I've never seen before. I love the humble and unceremonious ways that humanity's creative spirit delights and uplifts each of us. Thank you to the person who surrendered to their creative impulses becoming a vehicle for this wonderful patio cover. I'm sure its creation uplifted you, but today it also brightened the world for me. I'm thankful for this inspiration from the universe. Latillas that look like pencils. At the corner of Austin and Mims in Truth or Consequences, NM. New studio-gallery in Truth or Consequences, NM, Light of the Soul, will open March 11, 2017. 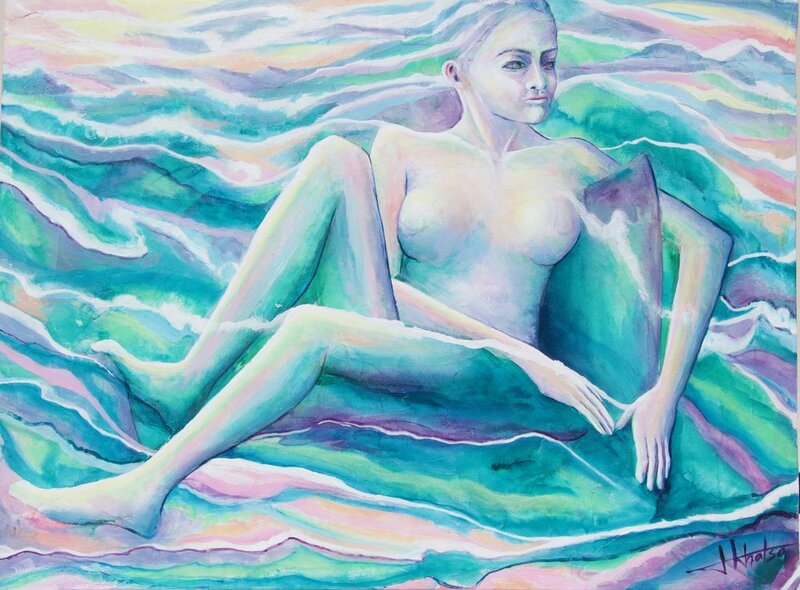 It's now listed online in the New Mexico Artists Directory. New painting, Determination, 48" x 36" will be exhibited. This little video tells the story of the great NM town that is new home to my studio. Across the street from Dust & Glitter and just past the El Cortez Theatre, you'll catch a glimpse of Light of the Soul, to open in March. I heartily encourage you to come experience this surprising little town for yourself. You'll be glad you did. Thoughts about the centrality of form. Yeah! Front of new studio has been painted. Yeah! Hard to believe, but this is the same building with the wood facade removed and the front painted. I would have preferred to keep the original red brick, but since the bottom had already been painted blue, the only feasible option was to paint it all. I think the gradated terra cotta colors work with the original brick work at the top. The concrete pillars will remain unpainted. The lettering for "Light of the Soul" has been ordered and will be installed on the horizontal concrete next month. I also plan to do something around the windows - not sure yet - maybe awnings or maybe some scroll work with mirror tiles. We'll see. Below is a close-up of the bench. I like the lotus flower. Glad to be off the very tall ladder. Next, inside walls will be painted. My husband and I have always enjoyed summers in New Mexico. For some time now, we've loved our off-the-grid adobe in the mountains of Catron County. Retired now, we expect to spend a good part of each year here. So I decided to relocate my studio here too. 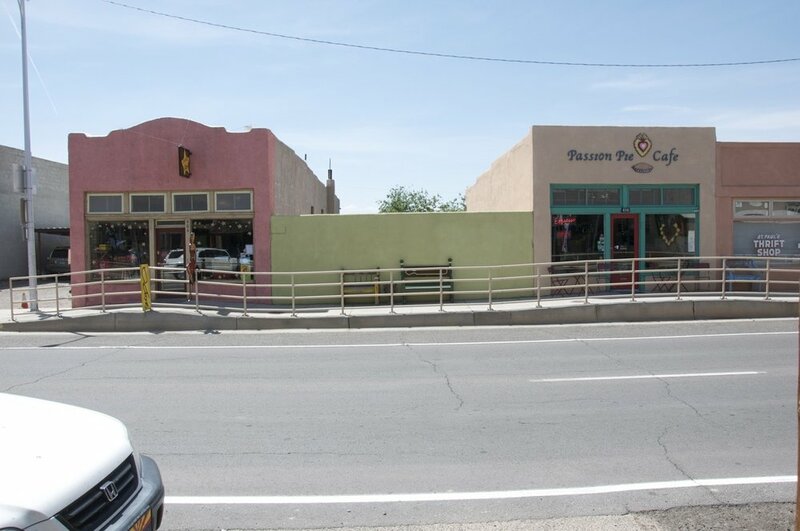 In the Spring, I found a building in a quirky hot springs town on the banks of the Rio Grande River - Truth or Consequences. Yes, that's the name - named after a 50's game show. I will work and exhibit in an old bank building (circa 1917) at 411 Main Street. (Living quarters in the back too.) I plan to open on 2nd Saturday Art Hop nights and event weekends. Until then, there's lots to do. This summer the roof was redone. Now I'm painting inside and out. Here are some photos. The top photo is the building when I got it. In the middle photo, the original building reveals itself as the "old western" facade and porch is removed. The bottom photo is a view across the street. More to be posted next week. 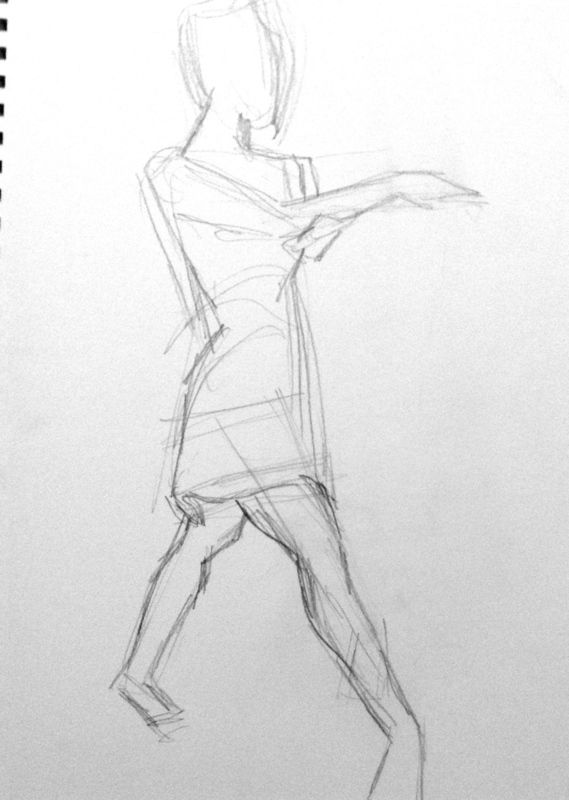 As I mentioned in my last blog post, at the Phoenix Art Museum, I happened upon a great sketching opportunity - a lovely dancer in frequently changing dynamic poses. I love to draw from life. Drawing from photos just doesn't compare. Only in life does one get such light and space. In the process of visualizing the shapes and angles in three-dimensional space, I lose myself. Only a live model brings her life energy to the sketch. As you could see from my last blog, I spent hours in quick sketches, but wanted more. So I asked her to model for me. She liked the idea too! I was thrilled. 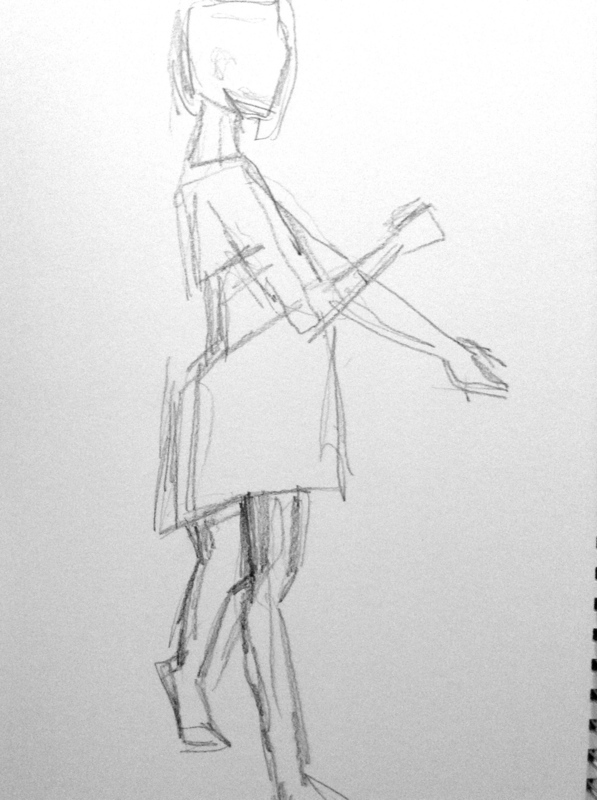 Here is a figure drawing of Stephanie during our first studio time together. What a fabulous model Stephanie is - beautiful inside and out. We plan to have more sessions in the months to come. I'll share my drawings and you'll get to enjoy her more too. Quiet Conversations I and II were my last paintings of 2015, each 36" x 48", to be hung side by side horizontally. 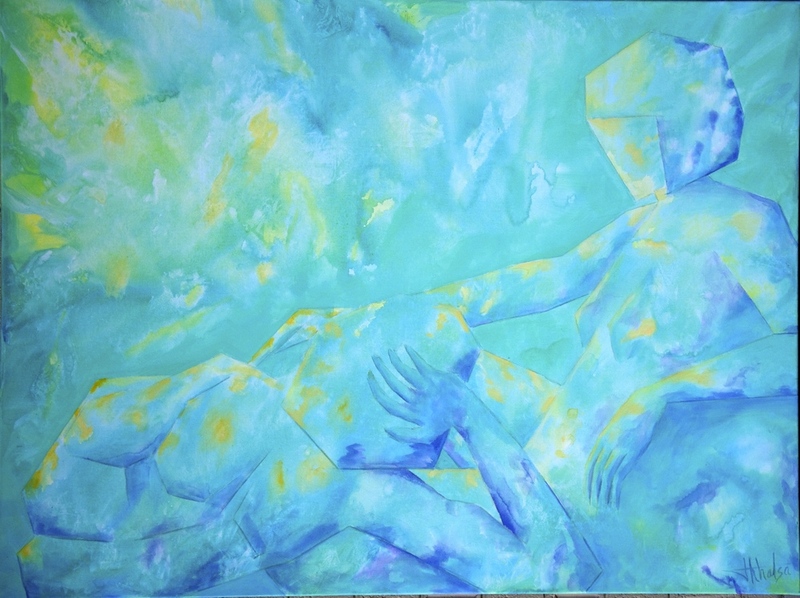 I enjoyed combining the looser green/blue/yellow/violet abstract with the geometric female figures so that they alternately merge and emerge. They convey intimate communication between friends. I hope the holidays have offered you too quality time with friends and family. Here's to embracing what 2016 will bring. This painting ofJawn Golo of Golo Family Organic Farms at the Phoenix Public Market downtown was painted as gift for her and her family as a small gesture of gratitude for the love, joy, and inspiration my husband and I have received buying produce grown and sold by her and her family. Compared to what we have received from her, it is only a small gesture. We have been blessed by Ms. Golo every Saturday for years. Ms. Golo received the painting yesterday but it wasn't quite dry. I will gift to her again at the market on Christmas Eve. She is a special lady. Here is a fun mixed media piece (16 x 16) which began as a pencil sketch of a live model. Then it was mounted on canvas where I played with color. It's at tonight's Phoenix Art Center's First Friday show called "Behind the Red Door," a reference to what happens behind the red door of Edna Dapo's Drawing and Painting classes. Fun, good times, and art. See the work of Edna's students at the Central Arts Plaza on Central Avenue (former Viad Building).